Get Customized IT Decision Makers List by SIC Code/NAICS Code that let you reach targeted businesses across the USA, UK, Canada, Europe & Australia. Optin Contacts offers you the most accurate and largest database of IT Decision Makers Email List database. Get complete contact details of the key individuals with the authority to the IT plans and information. Reach out to the key IT Executives Email List across all industry verticals. Geographies covered by our IT Decision Makers Email List include USA and Canada, UK, Germany, France, Italy, Japan, Malaysia, Singapore, Asia Pacific, and Australia. Our team of data experts acquire the data through in-depth research and maintain a process of regular updates and data cleansing to maintain the accuracy and freshness of the data. All our data is collected from publicly available sources and it is absolutely safe for you to contacts and connect with the individuals mentioned in the IT Decision Makers Email List. Optin Contacts IT Decision Makers Mailing Database contact information is versatile and can be effectively used for all channels of communication for your marketing campaigns. Whether you are planning for a postal campaign, an e-mail campaign, a telemarketing campaign or direct campaign, with the Optin Contacts IT Decision Makers Database you can effectively reach out to the right persons. Who are the IT Decision Makers? In this day of rapid technological advances, companies are increasingly spending bigger and bigger chunks of their budgets in on adopting newer and the latest IT systems and keeping the existing ones up to date. The demand for solutions such as ERP, CRM, SCM, and many others are high on demand. So is the demand for IT services such as implementation, customization, and up-gradation. To monitor and take the purchase decisions on the IT systems and related solutions every organization appoints an IT Decision Maker. This can be CEO, CTO or even a dedicated Executive of the organization. We give all persons mentioned in the list the option to be included in the list through the process of regular double opt-in email campaigns. 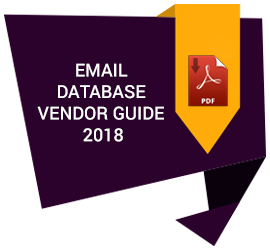 Get a free sample of the IT Decision Makers Email List today and experience the superior quality of data provided by Optin Contacts. We guarantee you that with the help of our IT Decision Makers List and the guidance of the team of data analysts your company’s ROI is sure to take an upward turn. So hurry up and don’t miss the chance to help your business succeed in this highly competitive market.